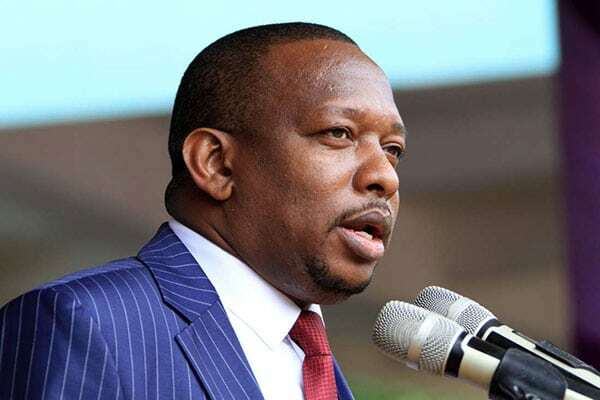 Nairobi Governor Mike Sonko has put forward a Ksh300,000 reward for Naoirobi residents if they bust and arrest cartels who divert water to private vendors by disconnecting water pipes in the city estates. Sonko revealed this on Saturday at Kiboro grounds in Mathare during the Nairobi monthly clean-up exercise. The governor also offered a reward of Ksh10,000 to the public if they bust and arrest Nairobi City County Government officials who collude with water cartels to divert pipe water to private water vendors. Water demand for Nairobi City is 790,000 cubic meters against an installed production capacity of 526,000 cubic meter. Sonko, however, promised that his administration, the national government and World Bank in collaboration with other donors are funding construction of phase 1 of the northern collector tunnel that will supply 140,000 cubic meters of water to Nairobi. The project is expected to be completed by October next year. “This project will divert flood water to the tunnel from three rivers; Gikigie, Irati and Maragua in Murang’a. The tunnel will bring water to Thika/Ndakaini dam whose yield today is unable to support the required production capacity of Ngethu water treatment works of 440,000 cubic meters,” Sonko said. Sonko further said his administration is working on plans to improve water supply to Langata and Karen areas. He said a pipeline is being laid from Kabete to Uthiru before connecting to Karen shopping centre and linking with the pipeline along Langata road. “This will address water supply problems in the whole of Langata constituency and remove the water conflict between Kibra and Langata constituencies,” Sonko said. “At South C along the Olive hospital road, the county has a 24,000,000 liter water tank which has the capacity to supply water to the entire Langata constituency,” Sonko added. He, however, expressed concern that many residential houses have been built on water lines that at some point the pipeline was blocked from supplying water to the reservoir. Estates within Langata are currently not receiving enough water because the pipeline which serves the area passes through Kibera where cartels have diverted water to sell to private vendors. “To address this problem, for the last two weeks we have been holding community mobilization meetings with the Kibera residents on how they can be served and release more water to estates in Lang’ata,” Sonko said.